The Magnolia Theatre in Dallas, TX will be hosting the WORLD PREMIERE of the film, a cinematic treasure in the tradition of the great Early East Prussian Expressionist Toilet Films. 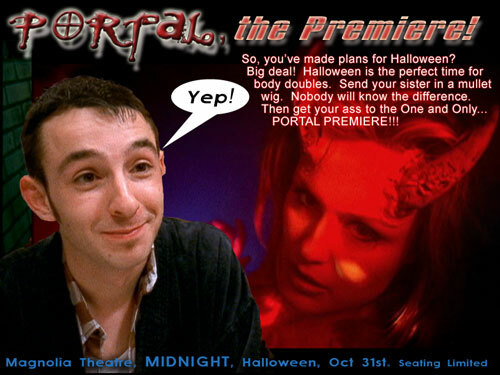 So cancel all your plans and get your costumed bodies down to the Magnolia Theatre this Halloween. What: The long awaited release of the most explosive case of toilet humor ever captured on film! Cast and crew are guaranteed 2 seats with RSVP. All other seats are finders keepers, loser weepers! Arrive early and have a drink at the bar. Thanks and may the PORTAL be with you. I'm not much of a fan of that kind of humor, but the trailer got a couple of chuckles out of me. Good luck with the film. Neither am I, which was a big reason for writing and making it. This weekend, I'll be completing an interview portion for the "making of" documentary, plus audio commentary for the DVD. I thought I'd left comments about this, but maybe it was on another thread. Anywho, the trailers made me chuckle, and I look forward catching this on video. Will there be a while release? "Portal" screened last February at the Spindeltop/Lamar University Film Festival and won "Best Advanced Narrative" befroe undergoing an extensive re-edit. It will be screening again at the Dead Center Film Festival in Oklahoma City, OK on Friday, June 11th (or Saturday June 12th, technicallay) as part of the "Midnight Shorts" program. "Portal" will also be screening this month at the San Antonio Underground Film Festival. JUST finished up working on a shoot in time to inform you all that "Portal" will be playing next Tuesday, October 19th at the Deep Ellum Film Festival.